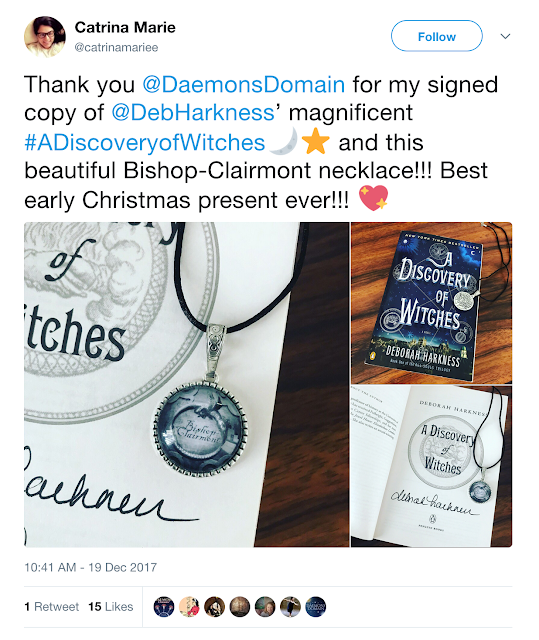 Daemons Domain - All Souls Trilogy & Universe Fan Site + Podcast: 2017 Holiday Giveaway! Glitz and glam for the holidays? Yes, but this year there is a twist! We are going to gift like Phoebe! This year has gone fast! 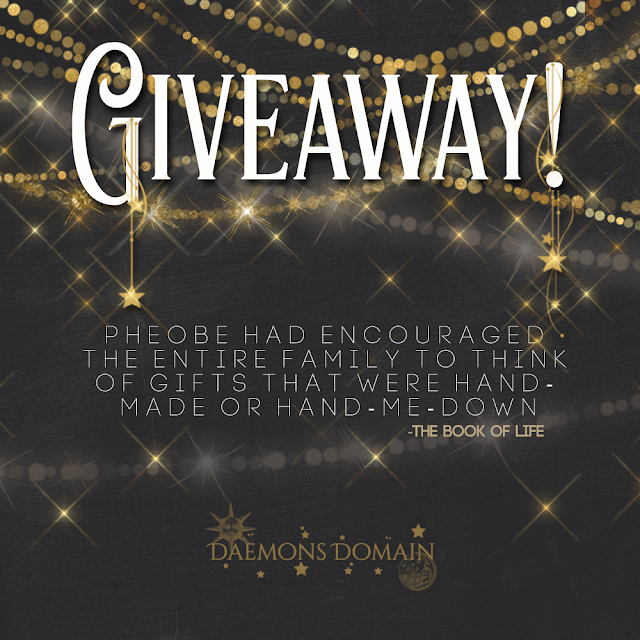 As we find ourselves firmly in the holiday season, it's time for our annual holiday giveaway! We are taking a page out of Phoebe's book; we are going to give something considered a hand-me-down and something hand-made. As usual, we've provided several ways to enter, including podcast trivia, social media follows, and of course you can tweet about this daily (do one, some, or all)! Have a copy already? What a perfect gift for the like-minded reader that you hold dear. ☞ A Discovery of Witches (US paperback), signed by Deborah Harkness. We are offering a hand-me-down ... or better, a well-loved copy of A Discovery of Witches to a lucky recipient! And yes, it’s signed! Great gift for first time readers of the story, people who have the ebook and would appreciate a signed physical copy, or people who have not had an opportunity to get a signed copy at all. 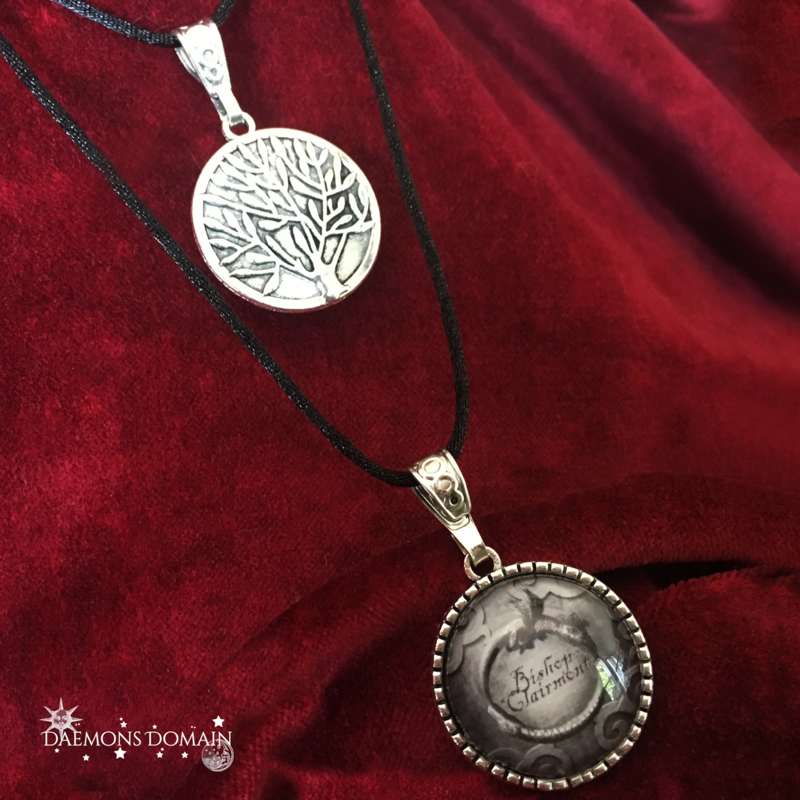 On one side is our version of Jack's design with the Bishop/Clairmont scion name, the other side shows The Tree of Life. ☞ A glass cabochon necklace featuring the snake/firedrake ouroboros design. Jack gifted his drawing of the Bishop Clairmont scion design to Diana and Matthew, so we found this rather fitting. This is our hand-made offering. It sold out at All Souls Con 2017 (all proceeds -- including the cost of production -- went to the Bodleian), and we probably won't be able to sell them again as shown (we are not trying to step on legal landmines! However, we can give it away with a clear conscience). Most likely the style version that will come out for sale next year will not have "Bishop - Clairmont" on it! Update 19 Dec 2017: Congratulations, Catrina!